Estelle Weaver, 35, joined Detroit Mercy Dental Center as a patient in 2015. She had many dental needs and access to affordable care was a top priority. At the time, in addition to tooth pain, she was experiencing a high-risk pregnancy due to several health conditions. She also demonstrated anxiety about dental treatment because of her pregnancy. During her first appointment for an emergency extraction, a faculty nurse was present, and students and faculty contacted her OB-GYN to discuss her conditions. This eased her anxiety and established trust in the experience she would have as a patient here. “I was impressed by their willingness to reach out to my doctor and still take me on as a patient, considering I was dealing with multiple complications,” Weaver said. Throughout her life, she experienced many dental problems, undergoing a host of restorations, root canals and extractions. The condition of her mouth was dire – she was at a crossroads with her treatment plan and needed to decide what to do moving forward. Ultimately, she decided to go with a full denture. The process would take longer than it would had she gone to a non-learning facility, but she knew her time investment was balanced with attentiveness, thorough explanations, and affordability. For someone like Weaver, with a complex medical history, continuity of care as students graduate is essential. Last year, when her fourth-year provider moved onward, her third-year partner took over her case. This made for a simple transition because both providers were aware of her needs and preferences. “It’s nice to not have to go over my entire list of medications and diagnoses, which is consuming and tedious. When my third-year student took over I already knew him well and trusted him, and he knew me and my situation,” she explains. A mother to five young children and manager of her household, Weaver is also enrolled in a graduate program pursuing a dual degree in Divinity and Social Work. For the past year, she searched for a job in her field, but her interviews were unsuccessful. 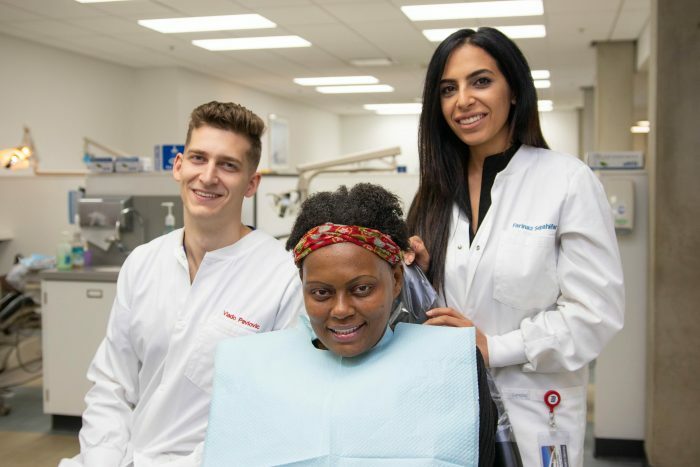 We are proud to have been able to have a part in facilitating a optimum oral health and helping Estelle get the job. Her story is one example of how we work to improve the overall well-being of our patients.